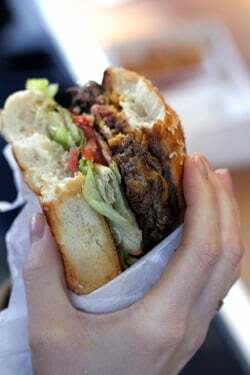 Hamburgers have certainly become a much bigger part of the landscape in Paris since a while back, when I jotted down where to get burgers in Paris. 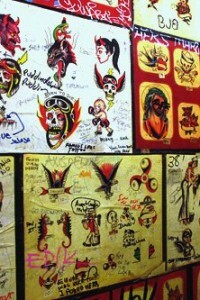 At that time, they were just breaking out of fast-food joints and becoming a novelty in restaurants and cafés. 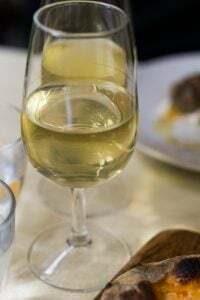 Yet nowadays, you can go into almost any lunch spot and it’s not uncommon to see a Parisian diner carefully cutting through the layers of un cheese (as they call a cheeseburger) with great precision, using a knife and fork. I’ve sampled a few around town, but the problem is that no matter how you order it, the hamburgers generally aren’t very good. The beef is usually dry. And to make matters worse, it’s sandwiched between one of those cellophane-wrapped supermarket hamburger buns. And to make matters even worse, it’s served with a side of half-cooked frites that one could easily tie into a knot, which I once did to a few of them and left them my plate, hoping that someone in the kitchen might get the message. I’ve always found the whole thing rather odd considering there’s a bread bakery on every corner in Paris and a good butcher usually isn’t all that far away, so one can’t say the ingredients aren’t there. And the French love very rare beef. So why are people content to eat mediocre, pre-made beef patties cooked to a fare thee well, slid between a spongy supermarket bun, with a limp slice of orange American cheese on top? 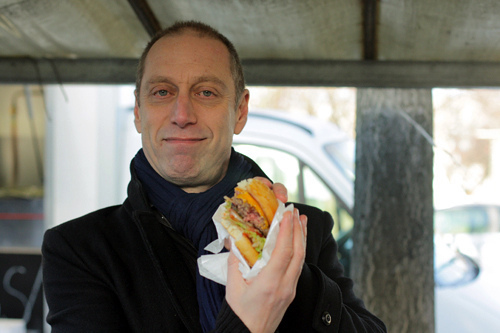 My take is that the French don’t take hamburgers seriously – they’re more into the novelty of the experience rather than the reality that a good burger is truly a delicious sandwich. Because when all the good ingredients are here – the world’s best cheese, excellent beef, and some of the best potatoes I’ve ever had – there really isn’t any excuse for not cooking with them. But perhaps if the only exposure you’ve had to hamburgers are the fast-food ones, and you don’t have any references to the real thing, then the unspectacular examples around town are adequate. Yet a good burger should be taken seriously, and with all the good products here, I’m happy to say that it’s finally occurred to someone to fry up a great burger and fries: beef that’s just-ground and not too lean, a freshly toasted bun made by a local baker, and French fries that are cooked until crisp. I’ve thought over the years that if someone were to open a really good burger shop in Paris, making everything right, they’d have a hit on their hands. And Kristin Frederick, who graduated from a top-rated French culinary school here pulled it off by pulling her food truck, Le Camion Qui Fume, up to the Paris curb. Kristin went through quite a few hurdles to get her food truck rolling, so to speak, since like shaking up the notion that burgers are merely fast-food fare, it can be a challenge to get the powers that be to imagine something “outside the box” — or outside l’hexagone. Food served from a truck? C’est pas possible! Needless to say, nothing like this really existed before, so she had her work cut out for her. In spite of the dreary winter morning, I was excited to show up near the Port Maillot at one of the markets Kristin pulls up to a few times each week. Two French television crews were excitedly filming the action and a couple of us brave souls had shown up early to beat the rush. With a scarf pulled up around my neck and my eyes bleary and red from the chilly wind coming off the nearby traffic roundabout, I watched Kristin and her assistant fry of batches of onion rings made from fresh onions (not from a freezer bag) and preparing frites maison (French fries made in-house) from fresh potatoes, which they cooked until deep golden brown. In spite of the cold, I was in no hurry to go anywhere and couldn’t wait to dig in. I ordered my ‘Classique‘ without mayo*, against the suggestion of the menu, which drew jeers from the peanut gallery. 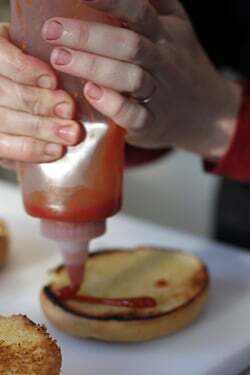 And once I bit into the burger, I realized that it would have been even better with that extra little slick of sauce. Lesson learned: Take the cook’s advice when ordering food. And aside from my own fault for not heeding the advice of the chef, my only quibble was that the bun was very good on its own, but it was a little dense in conjunction with beefy burger. Some of the people chiding me were a friendly American-French duo, who I started chatting with in both languages as we began to chow down on our juicy burgers, standing at a table together. Under the grey skies and with the traffic of Paris whooshing by and our chilly fingers grabbing at our fries, each of us was devising a strategy for how best to grab the beasts without looking totally goofy, making a good show of it while we tried to maintain some sense of dignity. We were still in Paris, after all. Although it’s nearly impossible to get a dignified-looking picture of someone mid-bite, she was sporting enough to let me take a picture of her going for it, American-style. And while her French lunch companion – to my astonishment – went back and ordered a second burger and a second order of fries, I figured that turnabout is always fair play and she got a few shots of me working on my burger as well. And that, my friends, I gave the thumbs up to, which didn’t require any translating. Schedule and locations at their website and Twitter feed. *I never got the appeal of adding mayonnaise, oil and egg yolks, to a hamburger. However add a bunch of garlic to it, call it aïoli, and I’m all over it. Go figure. 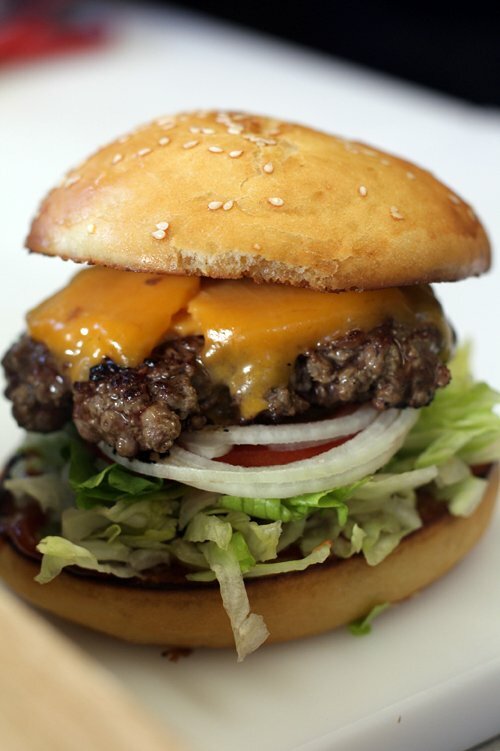 Lucky I don’t have to book a flight to Paris for a good burger because given the right moment…I might. I love the story of this one young woman sticking to it and accomplishing her goal…and good thing that goal suits you and others…bravo to her! Barbara: I’ve been thinking about it, with the influx of American or American-trained cooks in Paris having success, and it’s partially because it’s part of our culture to want to succeed at what we do. 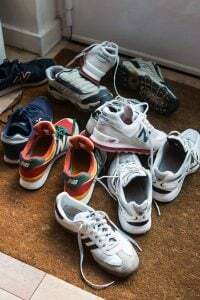 Plus we’re such a mix of cultures and traditions that we’re pretty flexible, and not so rooted in tradition – we take more chances and are good at thinking “outside the box”. I wondered the exact same things about Parisian burgers. How could they even use that godawful orange goo people call “cheese” when they have the most delicious cheeses in the world at their disposal? 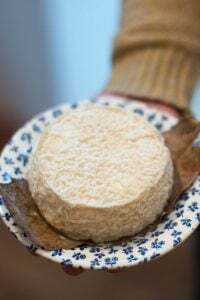 And why use supermarket buns and cook the beef ’til it’s dry when the French are famously particular about their bread and how their meat is cooked. It did not make sense at all. 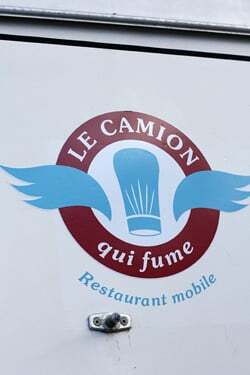 I’ll definitely be on the lookout for Le Camion Qui Fume when I’m back in Paris. I don’t when that’ll be but I already know where I’ll be eating a lot of my meals, thanks to you, David. Totally true about a hamburger actually being a really good sandwich. Usually I will try not to over build my burgers as I hate it when they start to fall apart, I like bun and meat until the last bite. Some bacon, Castello and carmelised onions and I’m in a good place..
*sigh* The pictures are beautiful. I’ve been twice already, the first time went relatively well, but the second, the line to order was an hour long, and then it took more than an hour to be served. Not to mention about 30 people behind us in line were turned away, as not enough burgers had been prepared for the evening–we were the last order. so yes, the burgers are terribly tasty (my french boyfriend ordered a double AND an additional burger last time…), but I hope they get a handle on the service son, or I fear all of the media attention will be doing them a disservice. As someone who has worked in the food business, I know first-hand that opening a business (especially one that didn’t exist before) is a big challenge. I’d heard about the lines and Kristin told me that she was scrambling to open the off-site kitchen to facilitate things. So hopefully that’s going to make things so smoother than the opening weeks. I did wait before writing about Le Camion Qui Fume because, yes, there was a tumble of people writing about it. And it seemed like it was good to give them time to work out kinks. Le Food Truck existe a Paris. Formidable. Now, the only thing that would rock my world is if she added a realllly good veggie burger to the menu. I know, I know, but one can dream. Oh this makes me very jealous! I live in the land of beef (Alberta, Canada) but yet can’t find a juicy and tasty hamburger since hamburgers HAVE to be completely cooked (if not charred) by law, here. Highly depressing. 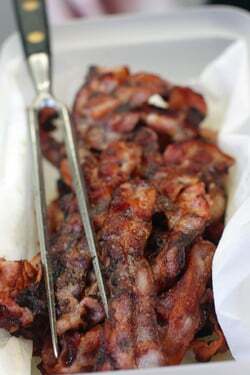 It is 11:20 PM here in the Pacific Northwest USA and I am sitting here at my computer fairly drooling. Oh my, what a mean thing to do to us; well, I guess it is not so mean to those readers where it is actually a mealtime. 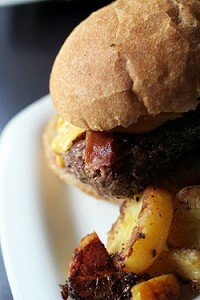 But tomorrow a Tillamook Pepper-Bacon Cheeseburger at Burgerville is definitely in the picture. Until then….I’ll just continue mopping up the keyboard. Glad there is at long last a good “Classique” with, or without, mayo in your life. Consider it a great start for a Happy 2012. We have an excellent burger joint here in Nantes, The Burger House. 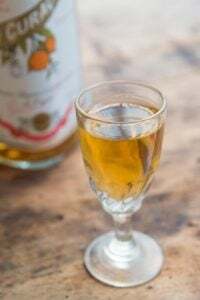 The Floridian who opened it has since moved on to Saint Nazaire, selling the whole thing, including recipes, to a Frenchwoman. So far the quality has remained high! Very happy to hear that it is a success. 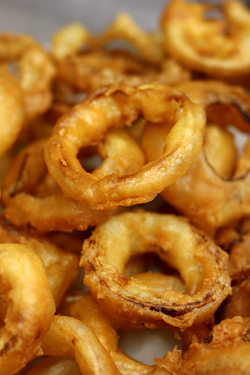 The burgers look amazing and I can’t remember the last time I had good onion rings…those look perfect! Can’t wait to try them next time I’m in town. It sounds as though Paris and London are echoing each other on this one – the recent surge in interest (and availability) of great burgers and the growth of higher quality street food. The comments on both the quality and the queues for Le Camion Qui Fume remind me of the posts I read on London food blogs about the now infamous Meatwagon (now transformed into Meatliquor, a permanent restaurant). For me, even the best burger in the world (and I do genuinely adore a good burger) couldn’t entice me to queue for an age to place my order and then wait another age for it to be made. More recently, I did make the effort to visit another high end burger truck called Lucky Chip, in London’s Netil Market, right around the corner from the better known Broadway Market. http://www.kaveyeats.com/2011/12/lucky-chip-london-fields-brewery.html I loved it and have been plotting to go back the next free Saturday we have. Sadly, whilst on one hand, good food is getting better and better, on the other, bad food is getting worse and more and more widely available / eaten. It seems to me that France is following the UK on that front, with the slow move away from home-cooked to ready-made and from decent restaurants to fast food. I guess it’s the same as how the UK were 10 or 20 years behind the USA on that front. It’s weird to me because, as I said, the other side of the coin is that it’s getting easier to find great food and more people are showing an interest in cookery shows, cookery books and (to a lesser extent) home cooking. I really wish I could bite into that Burger right now, and that means something – it’s 10am in the morning and I did not even have breakfast yet! Were her troubles getting the thing going just because she is in Paris? Here in the countryside, pizza vans are common and I don’t see that the hygiene issues etc would be much different. Is it a parking and space problem in Paris? Anyway, good on her for persisting and creating a great sounding product. Re the other type of hamburger and chips available in France – we ate at Quick once last year. I was horrified at how poor the food was and couldn’t understand it. Very bizarre that French fastfood outlets can’t do food that served in any other context here would be superb. I don’t know what happened, but she had that “look in her eyes” that I’ve come to know well, when someone’s had to face an unyielding force greater than they are. I know there are pizza trucks outside of Paris, but am not sure the difference. I do know from friends, both French and foreign, that opening a business is a challenge. I wish Kristin and her team lots of success – not everyone has the gumption to start such a business in Paris and prepare meals in the open kitchen of a food truck on chilly days. One of the other aspects that I really like about food trucks, both the ones in the USA and Le Camion Qui Fume, is the friendliness and ease with which people waiting in line start talking to each other. 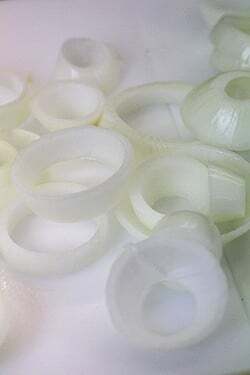 Yup, it’s time for me to go back and have some more of their onions rings (yummy!) and another burger. Many thanks for the mention and link to my post about Le Camion Qui Fume. Kristen’s burgers are fantastic, I agree. Super juicy and well-seasoned. Good luck to her! Take a meal outdoor has become a hard task. I, particularly, prefer prepare my own food, no matter if a hamburger or a special dish. Looking for a perfect hamburger? So do I… Because of this, I’m in the polity of “do it yourself”. Like garlic? put it on! Hate onions? take it away! Prefer your beef with butter flavor insted of oil? Do it as you wish! it looks so yummy!!! i am gonna try it later, I’m even hungry now. Could it be that a supplier is selling Parisian restaurants “authentic” American hamburger buns (like the kind we buy at the grocery store) and also frozen hamburger patties a la McDonald’s? Are they thinking burgers are supposed to taste like that or are they trying to make money by selling cardboard burgers like Americans do? Pretty tragic that our cuisine (is you can call it that) is seeping into theirs… But you gotta laugh at the sight of you showing everyone how to eat a hamburger. Food trucks are the rage here in North Carolina and for very good reason. Each specializes in a few things and turns out a quality product. I’m also impressed that the owners, chefs, waitstaff are the same person(s)…YOUNG adults creating a business that they’d never be able to afford in a bricks-and-mortar restaurant. Kudos! I wrote a story on my blog “Follow That Food Truck” but don’t want to spam your comments with the link. We’ll be in Paris in April…but…I’ll probably skip dining at the food truck since I eat great burgers here in the US. Le camion qui smokes? Very cute name. We have un camion qui idles with it’s motor on at 7 a.m. on Sunday mornings. It’s called Fresh Direct. You would think that the idea of a high end food truck would eventually take on in Rome. There are already trucks that sell porchetta, so burgers as a next step would be a natural progression. That said, burgers are making inroads here. 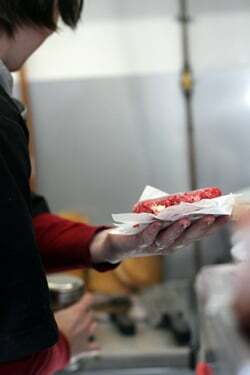 I recently was asked to judge four of most recent restaurants that have put them on their menus (for a round up see http://www.elizabethminchilliinrome.com/2011/12/rome-burger-contest-results.html). Most were actually pretty good, with the meat and bread spot on. Can barbeque be far behind? Even if, in Quebec, there is a lot of place where they serve burgers. They aren’t all very good. Cooking with fresh and good ingredients does’nt matter to a lot of people aruond here. That’s why I’m preparing my own burgers with goooooodddd meat! Your burger really looks good! I’m craving one, right know! Wow. I can make a good burger for myself, but those onion rings have me swooning. Thanks for the wonderful post, David, and am glad you have a good burger and fries to go along with the bread, chocolate, and produce. God, I could not agree more about finding a decent burger in Paris. I love a good burger, but I gave up a long time ago. Not sure the food truck concept will work for the French since burgers are so messy to eat. My French husband eats his burgers with a fork and knife and will not eat a meal standing up. I have explained the food truck trend to Frenchies who think it is a horrible idea. 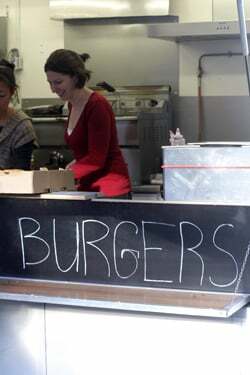 Maybe after Kristin makes some money and gets a reputation, she can open a proper burger joint. Also, you probably heard about Blend in Paris? They just opened up and are supposed to be the best burgers in town. Homemade buns too! I was once served a burger in a restaurant in France that only came with the top part of the bun. Perhaps they heard my accent and left it off because they didn’t want me to embarrass the other patrons by picking it up and shoving it in my mouth! I know that Blend just opened, but I haven’t been yet. Le Fooding just wrote it up and it looks interesting, and the fries peeking out of the basket look great. I am probably a strange duck since I like mayo on my frites but only ketchup, mustard, too many onions and sweet pickle relish on a burger. OK, sometimes a bit of blue cheese. 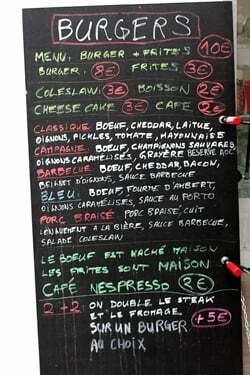 I am glad to know that there is a chance of a good burger in Paris for the next time I am there. But it is going to be even more fun to be able to tell my niece and her children who live in Brussels and only make it home about twice a year about it. It will give them one more reason to visit Paris. Ok, I want a hamburger for dinner now … except they are impossible to find in Zurich unless McDonald’s is an option. Might have to make some from scratch at home. Great post and delicious-looking photos! I’m always hungry after visiting your blog! David, I find that pulling out the “excess dough” from inside the top of the bun makes it less dense. I even do that here at home in Colorado…also lightens the carb load…allowing one to eat more fries! I actually discovered that the best buns for hamburgers are English muffins. 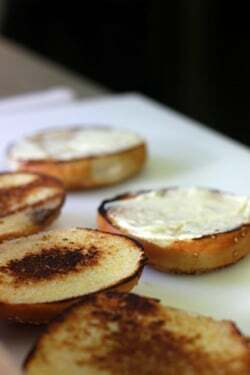 They’re not too thick, and when toasted, are just the right combination of crisp and bready. 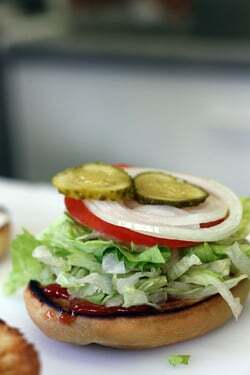 And their slender profile lets the burger shine. Tying knots in french fries/frites to send a message to the kitchen is so funny and brilliant. Thanks for the image and the laugh! I have to admit though – sometimes I’m happy to find a limp french fry and chow down on it. But, on the whole, frites should have “crunch”! Mercis d en parler …Cela va faire le tour de la blogosphere….Enfin de la bonne streetfood …Rien a voir avec le camion frites, et qu est ce qu on boit avec , un coup de rouge , surtout pas un coke!!!!! It’s amazing what a brilliantly made burger and fries can do for a person. I also love the idea of tying the fries in a knot…something I myself have been tempted to do with limp or soggy fries. Bleagh! By the way, David, I was tickled pink the other evening to catch you on Nightline talking about the use of ketchup in Paris. You did us proud! One of the things my French husband laments about in France (we live in Provence) is the lack of a good burger. He loves going to the burger joints in the States whenever we visit. Next time we’re in Paris, I’ll look up this place for him. He’ll be thrilled. I am so glad I found your blog. I am an American who has lived all over France for the last 10 years, currently living down in Toulon, and I find myself laughing out loud at your stories because I can relate to them. Actually just went to pick up some groceries for a dinner party that I see every day at the store only to be told they don’t carry what I need anymore…even though it was there two days ago!! We try to eat ‘local’ and ‘french’ most of the time but there are times when we crave a good ‘ole burger and can never re-create one, Now, when I’m in Paris, I can finally squash that craving. 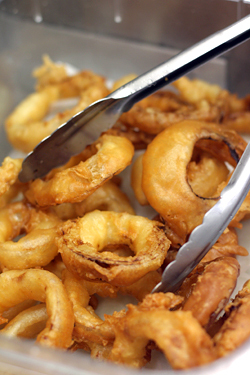 Damn, those onion rings look good! 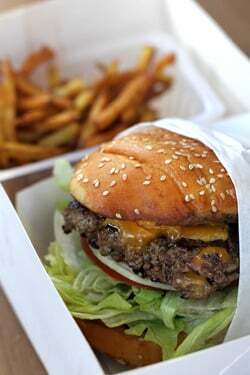 Next time you’re in SF, check out Super Duper Burger on Market@Noe. Nice juicy burgers made with Niman beef, excellent fries and dipped soft-serve cones. I go there far too often for my own good! 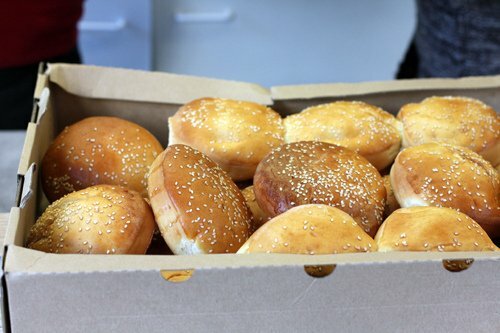 Now I know where the freshly ordered hamburger buns from our local bakery I’ve seen on occasion are headed. I’ve watched the order go out the door, wishing I could procure some myself. We live not far from Porte Maillot. Thanks for the address! Positively delicious photos David :) Thanks for linking to my article! Actually I like your * comment at the end of post. Too funny :-D.
Enjoyed the post. I am curious why a food truck would have such difficulty obtaining permits when crepe stands are ubiquitous in Paris…. Crêpe stands are always part of a storefront, rather than free-standing food establishments, which makes them a little easier to categorize. Plus they’ve been around for a while so the people at city hall are used to them. But when you offer up something like, say, a truck outfitted with a kitchen that cooks food to go, that I’m sure threw them for a loop. Things here can be quite regimented and when something different comes along, the people in charge aren’t very reactive. My bank stopped issuing paper statements but the people at city hall insisted on original copies, not those downloaded from the internet. When I explained to them that “originals” don’t exist, they were truly baffled and didn’t know how to deal with it. The world is changing, and things like food trucks and the internet are happening; it’s just that folks have been trained that things either are A, B, or C. So when D or E comes along, there’s no mechanism to deal with it. Anne at Prêt-A-Voyager just wrote about her bureaucratic experience and some of the hurdles she faced..and is facing…trying to become a commerçante. I dare say I am proud of Kristin, my friend, who cooked in my kitchen and gave classes for me, she is one of the best french cooks I ever met, with a true understanding and passion for la gastronomie. She overcame the obstacle of finding permits to park the truck with the support of her charming french husband Fred. Olivier and I bite into her hamburgers without hesitation, and we want mayonnaise, yes David, a little bit of sauce does not hurt. Looks like Le Camion Qui Fume know what they’re doing! My biggest pet peeve with hamburgers are lame buns. 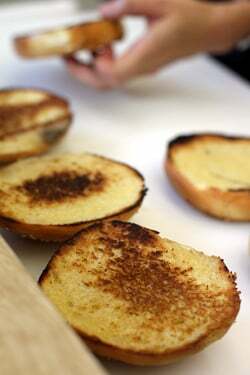 I am excited every time I spy perfect brioche buns gracing magazine photos. I am yet to find the ultimate bun and have tried making my own but let’s just say I have never been blessed by the bread making gods. Here in Adelaide, South Australia, the only food truck I’ve ever seen used to be parked permanently in front of the train station, and served that bizarre local delicacy of a mass produced pie in pea soup. I think the burgers sound significantly better. 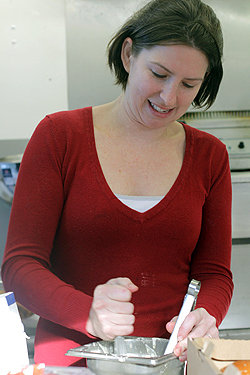 My very soul quails at what Kristin must have gone through to get her business going – I applaud her grit and her burgers sound delicious. However, I have to say I really don’t get the food truck thing. It just doesn’t seem that much fun to me to eat a whole meal standing up in the street. In NZ you’re most likely to find a good-quality burger in a cafe – you’re outside (if you want to be) but in comfort! Well, that looks almost as good as the Shake Shack cheeseburger I tried in NYC last October (which was the best burger of my life by the way)! The way you put it, really what’s the appeal of mayo…eggs and oil…at all? Yet it’s so good. Though with or without the mayonnaise that burger still looks awesome! Oh wow..de la Budweiser! Mais on reconnait plus Paris!! Rfaol! Was in Paris in October and became very puzzled by the enthusiasm for Le burger, especially in restaurants that were serving wonderful food. I didn’t have one. But, they looked like what McDonald’s would serve. At least half the people in one restaurant were ordering them, and carefully eating them with knife and fork. Glad I stayed with French. However, I may look her up next time I am there. I read an article a few years back titled, “France seeks to keep things French,” which made me chuckle a bit at the time. Now I am waxing a bit nostalgic for the sentiment. 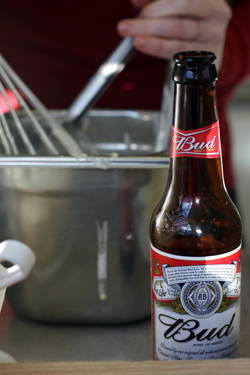 While I think it’s great that people all over experiment with so much, I am saddened at the loss of the concept of “foreign.” Budweiser and burgers in Paris? I tend to think the world is losing its local color. My vote is for more Pain Poilane and Beurre D’Isigny and less granola bars and Budweiser. Wish I’d eaten at the smoking truck and not at Ralph Lauren in Paris. Dreadful dry burger,fishy meat, nasty bun, soggy fries and major attitude. Worst. Meal. Ever. 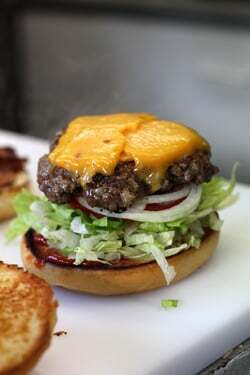 Off to chop my own burger and redeem the category – here at home in the Bay Area. With Acme ciabatta bun. David, you’re welcome to come for dinner. Medium rare? With just a little mayo? 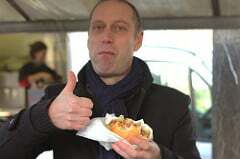 David, you should try the hamburger of the “Annexe du Dirigeable”, 4 rue de Dantzig Pariz XV! I very much like this post as it shows a field of the Parisian culinary landscape you wouldn’t associate with the French capital, at first. These burgers look extremely good, and as long as the quality is good, there is nothing bad about burgers, even if, sometimes, in France and elsewhere, a burger in genereal is considered as part of the “malbouffe”. Thanks for sharing. That’s funny that the idea of mayonnaise on a burger isn’t right, but a garlic aioli is just fine. In my neck of the woods, sweet pickle relish and buttermilk are added to mayonnaise and called ‘special sauce’. C est ce que j ai vu cet ete dans les Hamptons…TRES bonne pizza!!!!! Good one David. Thank you. oo i’m so glad someone is doing it right! 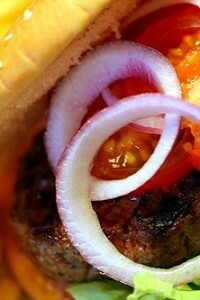 america doesn’t have much to offer the world when it comes to food legacies, but burgers can be really, really great. tell the people! I live in the US. Everytime I go to a ‘ethnic’ restaurant recently, I think of a conversation my husband and I had in Beijing. After a week of very local street eating, I confessed to wanting some ‘American” food, ideally, a hamburger. American food, he said, what is that? Or better, what is ‘Chinese’ food? What we’d eaten so far in Beijing was unrelated to most of the ‘Chinese’ food at home–especially that that claimed as much. I expected this, it was obvious. But I had not turned the question around. When I did, I found I could not describe what I meant. American food? What was American food? Burgers, tacos, bbq, pie, turkey? It could be anything, everything. And yet, I could not admit it was a fiction. I looked for a burger. There were ‘American’ style cafes in Beijing, but their food, to me, was anything but. But sometimes, you get suprised. A real good burger, for example. Like you want and expect. Done right. And more than the taste, I enjoy the comfort of knowing that, even though I cannot always put words to my cravings and expectations, there are others who understand. Hey David, do you think you could convince her to come to Uzès in August when the Parisians are all down here? I know some great spots to set up. 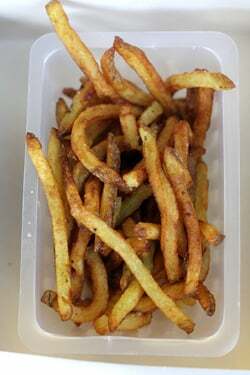 We have the ubiquitous pizza trucks here, and we have a guy that only does “Frites” but they are straight from Metro, out of the freezer and into the fryer. It’s hard to imagine that someone builds a business model on mediocre frozen fries, and even harder to believe that he’s successful! Went, today. Burgers are great. Sur M6 (local Paris TV station), interviewed Kristin and then wanted to interview me and my friends, but I’m camera shy so they interviewed my friend Marie Johnston (Zabie), we told them, much to the dismay of the French people around us, we told them and the newscast team that you must eat the burgers and fries with your hands, as is typical in Americans. So, they they wanted to use my hands holding a burger. I never thought I’d be a hand model, go figure? Definitely a must go, a little piece of home! Chapeau to Kristin and her team! Show will air tonight on M6 December 6. Enjoyed this post. As chef’s we know the simplest foods can be the most demanding to prepare. As you say, a good hamburger is a joy to find! I don’t eat burgers but have to admit that looks pretty kickass! Crazy!! I’m looking forward to going Paris so I can have a burger!! What a great idea and I wish her continued success!! I’m still working on my French so I had to look up the translation of the name. The Truck that Smokes!! I love it!! Thanks for the post David. I’ve been hearing about Camion Qui Fume for a little while now, and just made it out to try it today (11Jan 2012) at Porte Maillot. In short, Great Product, but they need to work on their workflow and business process. We waited about 1 hour and 15 minutes for our burgers, which seemed unjustifiable given that the line was somewhat long, but not THAT long. The three people inside the truck were not moving very fast, and they cooked only in batches, so that the grill would be empty for several minutes while they slowly looked at the line of burgers, then slowly wrapped and bagged them, and then (finally!) gave them out. Then, the cook would put a new batch of burgers on the grill. I know I should have gone at 11am or 11:30 instead of 12:15, but 20-30 minutes waiting in line, plus 75 minutes waiting for the burger — that was just ridiculous. Delicious, but here’s to hoping they get their act together. KC: Well, on the plus side, at least it shows there is a demand for food trucks in Paris. Sorry about the wait. I know they were blindsided by the popularity and they were hoping to get some of the back-end/kitchen stuff figured out. Hope that happens soon…because I’m ready for another burger..
RE: De Buyer Tarte Tatin pan. David et al. 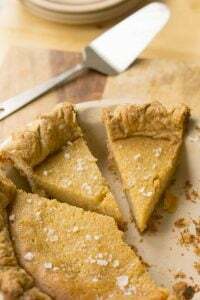 I have been scouring the world for the De Buyer pan ever since I made David’s Quince Tarte. I have contacted La Bovida in Paris who have been very accommodating. Only hitch is the paperwork of purchase I was sent via e mail attachments. Wire transfer to BNP Paribas, $45 wire charge by branch in San Francisco, etc. Amazon.fr lists its availability but again, all in French and I can only go so far into the various pages. Any hints that would help me purchase a pan? I have not found a merchant in the US who stocks the pan. Are you aware of any? Thanks all for any help you can give. RA: Your best bet if you can’t find one were you live (I don’t know where that is…perhaps in the US?) – if you know someone coming to France, they can probably pick one up for you. 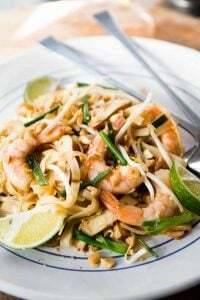 You can also check out my tips in How to Find Foods and Other Items Mentioned on the Site. 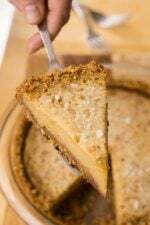 There are also places like Bridge and JB Prince in New York that have a wide selection of pastry items. I cant wait to visit her on my next trip to Paris. Decent hamburgers are just starting to make an appearance in Spain. But, here in Granada the best one is in my own house. I always say that it was the smell of grilled Spanish chorizo during a holiday here that changed me back to a carnivore but now that I think about it, the chorizo was just an excuse to be able to enjoy a great burger again! These were truly the Best Burgers in Town. I tried the Bleu, and I’m never going to eat anything else in my entire life. Thank you for sharing this!